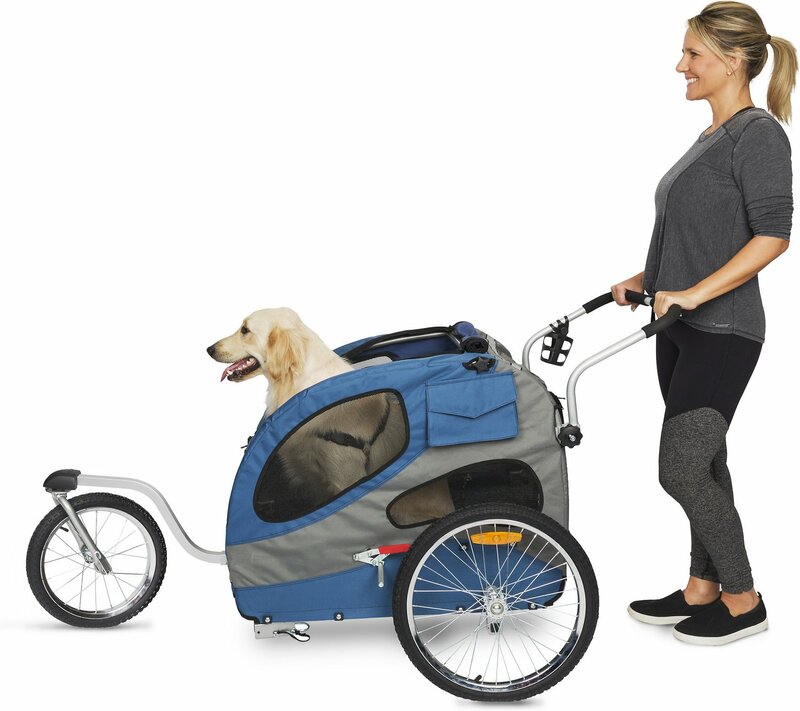 The Solvit Stroller Conversion Kit easily converts the HoundAbout II Trailer or the Solvit HoundAbout Classic Bicycle Trailer into a versatile, all-terrain stroller for pets. Want to go on a long walk or jog, but not sure your pet can make it all the way? Does your pet like to get outdoors but has trouble getting around due to injury, illness or old age? Convert your Solvit Trailer into a stroller with Solvit's easy-to-install Stroller Conversion Kit – includes a handlebar, front swiveling wheel, parking brake and cupholder. Converts from Trailer to Stroller in one minute. Designed to fit the Solvit HoundAbout II Aluminum Bicycle Trailer or the Solvit HoundAbout Classic Steel Bicycle Trailer. Always make sure the rear door is closed after pets are loaded and while jogger is in use. The trailer is equipped with reflectors at the rear of the cabin and on each wheel. There are also reflective strips across the top rear and lower front of the cabin. Carry a flashlight in low light conditions. The trailer/stroller is intended to carry pets only. No human passengers! Always stroll or jog with the rear door closed. When riding, your dog should always be secured with the safety leash adjusted to the correct length. Do not exceed the recommended weight capacity. Check tire inflation before every ride. Attach the gooseneck mounting plate: Position the mounting plate under the frame and pass bolts and washers through the frame tube and mounting plate. Using the provided hex wrench and 11mm wrench, tighten nuts fully. For maximum tightness, hold the hex wrench in place and turn the 11mm wrench. Assemble the front wheel to the forks of the gooseneck: Locate the front wheel spindle assembly and remove the cap nut, washer and spring from one side. Slide the wheel onto the spindle, then re-assemble the spring, washer and cap nut. Do not tighten the cap nut at this time. Place the wheel in the forks of the gooseneck assembly, so the springs, washers and nuts are all on the outside of the forks. Position the flange on each washer so it engages the hole on each fork, then tighten the cap nut enough so that the cam lever on the opposite side is tight when in the closed position. Attach the front wheel assembly: Slide the square tube on the front wheel gooseneck into the matching tube on the underside of the mounting plate. Align the holes in each tube, install the “quick release” pin and tighten fully. Install the parking brake: Remove the two screws with plastic bases found on the left side of the cabin, in front of the wheel and a few inches above the bottom of the frame. This will expose holes which pass from the outer fabric shell into the interior of the cabin. Starting from inside the cabin, insert one of the long screws + washer found in the brake kit through one of these holes. On the outside of the cabin, add one of the curved spacers with the curved side facing toward the cabin. Now slide the brake assembly over the screw and secure with the nut, hand-tight only. Repeat with the second screw + parts, then securely tighten both 9mm nuts. The parking brake is engaged by moving the brake lever to the forward position. Hint: if the brake seems difficult to operate, loosen the mounting screws one-quarter turn and re-test. Attach the handlebar: The fabric skin of the trailer has two holes on the rear panel, on either side of the door, which allow access to the frame tubing. The handlebar has two clamp brackets which are tightened with the black knob. Loosen the knob enough to allow the brackets to slide over the frame tube then tighten knob so brackets clamp firmly in place. Install the cup holder: The large clamp fits over the cushioned section of the handlebar; the small clamp fits over the non-cushioned section. Position the appropriate clamp and attach the cup holder with the nut and screw. Adjust tightness so the cup holder does not “tilt” while in use. This was a terrible item. We had to take it to a bike shop to have it reinforced. Wobbled so bad my dogs didn’t want to ride in it. The stroller conversion kit is awesome!!! It is easy to put together and serves the purpose for my pup that has not yet gotten all of her shots. Very easy to push too!!! 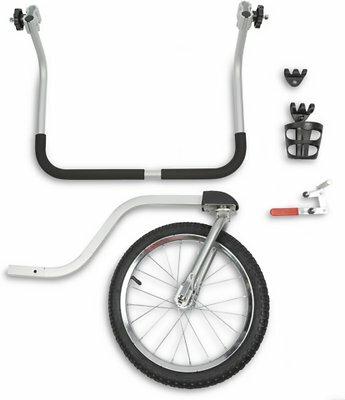 The conversion kit trades off from the bike trailer quickly and easily. It allows me to wheel my 3 legged Lab around while the Beagle walks along. A part was missing, and it took an entire week to arrive from the manufacturer. Looking forward to using this over the weekend. Glad to have the added versatility so the doggies can ride in style when the walk gets too long. The kit is fantastic for converting the bike trailer to pushed trailer. I have the large bike trailer so the total length is long but it allows me to easly push my boxer and both pomms without a struggle. Very easy to put on and remove for transport in my vehicle. I love this product! I use this with the houndabout II. It was easy to assemble, the directions could be a little better, but I figured it out. My dog weights 56 lbs and it medium to large in size. While pushing her, you really can't feel the weight of her. I was pleasantly surprised at how easy this stroller is to push. The kit is easy on and off with a quick release system, so you can switch from the bike attachment to stroller in a couple minutes. If my dog was heavier I might be concerned about the area that attaches the tire to the base of the stroller, as it doesn't seem like it could handle the full 110 lbs that it claims it can. Very light weight and easy to put together, pleased with product. 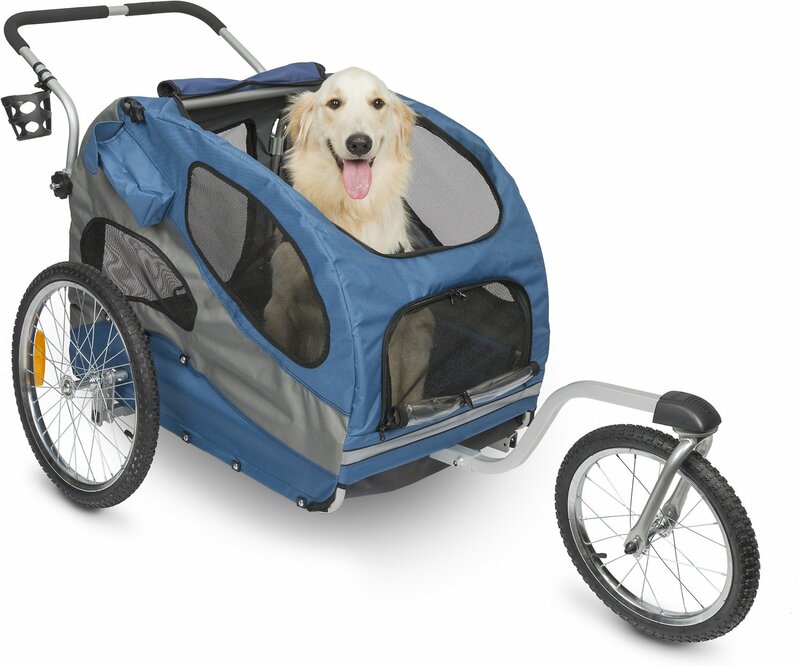 To help my dogs get used to the Solvit HoundAbout bike trailer, I purchased the stroller conversion kit. The directions were good and I am very pleased at how light the aluminum frame is. I was a bit nervous about putting my dogs in the bike trailer (couldn't see them or monitor their behavior) so, the stroller option is a perfect transition step. I am able to observe my dogs while they get used to the trailer. I look forward to attaching the trailer on my bike and taking a ride with my pups.